Computers are great tools for getting things done, but sometimes they cause problems that generate frustration, despair, and even anger! In this article, I’m going to discuss some of the reasons why computers stop working, behave badly, or otherwise don’t do as they are told! We’ll focus on problems (typically hardware) that occur before Windows or your operating system of choice is even loaded as well as some problems that occur while Windows is loading or after it has loaded completely. Problem: My computer doesn’t turn on at all! The reason for this problem could be many things actually. First we need to define what this means. Are there any lights on at all on the computer or the monitor? Do you feel airflow by the exhaust vent areas on the computer where hot air is expelled (usually near where the power cord plugs in on a desktop and usually on the side and/or back of a laptop). If there are no lights and it seems the fans are not running, then the first thing we should check is whether the computer is plugged in! Maybe someone accidentally unplugged the cord? Are we also sure that the circuit breaker didn’t trip? Try plugging something else into that electrical outlet to see if it turns on. Many times computers are plugged into surge protector power strips that also have their own circuit breaker, check this too. Once we are sure that where we are plugging the computer into is supplying power, we can proceed to our next logical conclusion…The power supply is not working! This is fairly common and luckily not an expensive repair. If you have a technical background and the necessary equipment (a voltmeter), you can quickly test to see if the power supply (in a desktop) or the power adapter (in a laptop) is putting out the required voltage. Even if it appears to be putting out the correct voltage when tested, sometimes when under an actual load such as powering up the computer, the power supply just can’t deliver the amount of power required and needs to be replaced. Testing for this condition is easiest by swapping out a known good power supply or testing with more advanced equipment. If we know that the power supply is working, but the computer still shows no signs of life, troubleshooting the problem can become a little more complex. It’s possible there is a component failure on the motherboard, or some other serious issue needing a professional to review. Problem: My computer turns on but hangs, freezes, is showing strange characters on the screen, etc. Sometimes a computer will power on, but before loading Windows or whatever operating system you might be using, it will suddenly stop, freeze, or hang and not go any further. You can always try turning your computer off, but if you get the same symptoms again, most likely it is a failure of a component causing the problem. Many times the computer will beep a sequence of long and/or short beeps that can be translated to give you a better idea of what is wrong. This is especially helpful if the computer turns on but is not displaying anything on the screen! Resolving problems like this generally requires a professional with the troubleshooting skills and equipment to diagnose and resolve the problem, however I will give some DIY helpful hints to those who would like to try a few things first before consulting a professional. 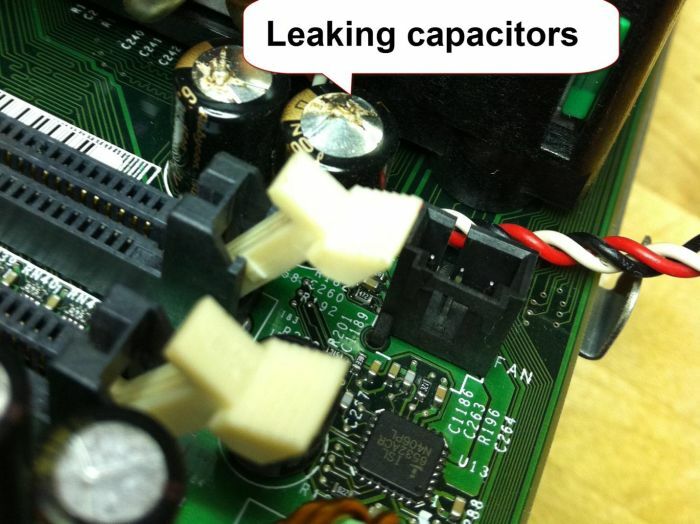 Typical problems in this category may involve failed leaking capacitors (see below picture), bad memory modules, failed or failing graphics cards, failed heat sinks, failing power supply, etc, etc, etc! Some of these issues require desoldering the failed components on a motherboard and replacing with new components. Work like this is generally best left to a professional with experience in component level motherboard repair (Inline Tech routinely performs this work). Figure 1. Picture showing failed capacitors on a motherboard that are leaking and out of specification causing a system non-boot condition. Sometimes though the problem is simple and related to the memory modules, so you can try this yourself in an attempt to fix your computer! If you have a desktop PC and are so inclined, you can open the side of the case and try removing and reseating the memory modules. Many times the contacts on the memory modules get oxidized and no longer make a good electrical connection. The simple act of removing and reseating the memory modules might just fix your problem! You can do the same for a laptop as there is generally a small cover with a screw or two on the bottom of the laptop that once you remove, you can remove and reseat the memory modules. If you have a desktop PC you can also try to remove and reseat any expansion cards to eliminate that as a potential problem. Figure 2. Example of reseating memory in a desktop PC. Pressing outward on the white plastic clips will cause the memory module to pop out of its socket. Simply press the memory module back down until the white plastic clips lock back into place. Another simple DIY fix is the CMOS battery. If the battery is dead, you will sometimes see an error message on the screen that the date/time and other settings are invalid. If you notice that round shiny circle above my left thumb in the picture above, that is a CR2032 3v coin cell, which can be found at pretty much any store that sells batteries. It’s usually quite simple to remove the battery and replace with a new one (Please make sure the computer is unplugged when doing this!). Many times troubleshooting issues can be very complex and only when you have years of prior experience does it seem “easy”. That said, many times you might be able to fix the problem yourself with a little detective work and if not, Inline Tech is always available if you have questions or problems you just can’t seem to figure out. Problem: Windows is very slow to load or stops before I can do anything! The reason for this problem could be many things; it could be a hardware or a software problem. In more instances than I can recount at this point, it is a hardware problem with the hard disk inside the computer. The hard disk is the component that stores all of the information in your computer, the operating system (Windows), your programs such as Microsoft Office, Internet Explorer, etc. and all of your data (pictures, music, etc.) Over time hard disks develop bad areas on them and the computer then has a difficult time reading and writing to those areas. They are kind of like pot holes in the road, they start off small (you barely feel it when you go over them) and over time they get progressively worse (they destroy your vehicles suspension). If your computer seems to stall out while loading windows and you notice the hard drive light constantly on or flashing in a periodic sequence, odds are the hard disk has developed an area that has become so bad that the disk can no longer easily read the data and it keeps trying in hopes that it will be able to. It’s important to have your computer looked at ASAP when this is happening because at some point the disk will completely fail and your data will be gone forever (well, not forever, but the drive will need to be sent offsite to a data recovery firm who can take the drive apart and this service typically runs about $1500!). If serviced before the drive completely fails, there is a greater chance at successfully backing up and recovering the data with advanced data recovery tools. Problem: My computer runs slow after Windows has loaded. There are many reasons why this could be happening. I’ll try to cover a few of the most common issues. First, your computer could have a virus! This is probably one of the most common reasons and luckily fixable. Even if your computer has an anti-virus software product installed, it’s quite possible and even probable that your computer might be infected with a virus. I’ve worked on many computers that were supposedly protected with well known brand name products that all got infected with viruses. Computer viruses have gotten increasing complex and more sophisticated in the past few years and only a few products or combination of products and smart computing habits can fully protect you from getting infected. Once you are infected, removing the virus can be tricky, even for a seasoned professional, but most times the infected computer can be cleaned up without having to re-install the operating system. Many times I get calls from customers that have had their PC’s looked at by other computer repair shops and they were told their computer does not have a virus. Unfortunately, not everyone has the same level of expertise or knowledge in finding and removing computer viruses. The only way to effectively know for sure that your computer is not infected is to scan the hard drive from a known clean system. This is because some viruses called root kits effectively hide themselves while Windows is running and simply running a scan on the system that is infected and running Windows will not reveal the root kit infection! Other issues that might cause your computer to run slow include misconfigured software installed on your computer, poorly behaving antivirus software, a badly fragmented hard disk, or too many software applications that load at the startup of Windows. I had one recent case where a customer had a laptop that was running extremely sluggish. After checking all the usual suspects, I had to dig a little deeper by analyzing what processes were running on the system. I found that this customer had the Lotus Notes client installed by their corporate IT staff and it was not configured correctly. As a result, even though the Notes client wasn’t even running, every few seconds it was killing system performance by overtaxing the CPU and the disk drive. After reconfiguring this service correctly, the system immediately started running perfectly! Regarding antivirus software, there are many poor products out there that slow down a PC horribly and removing them and replacing them with a better product improves performance dramatically. Also, there are many products that masquerade themselves as anti-virus software when in fact they either don’t do anything or actually infect your system! Be very wary of any software you might see online offering a free scan on your computer. Always check with someone who is tech-savvy before installing any software you aren’t 100% sure about as it might slow down or damage your computer. Hard drives over time become fragmented and that can slow down Windows as well. Fragmentation occurs when there isn’t enough free space to place a file and files get broken into chunks and placed in various free spots along the disk which are not contiguous. Because of this, to then read that file at a later time, the hard drive has to do extra work to visit all of those areas to read the complete file. Compound this problem by the thousands of files on a hard drive and things really start to slow down. Running a defragmentation program can definitely help improve performance and reduce wear and tear on your hard drive. Although Windows comes with a built in defragment program, I’ve never been too impressed with it. I generally recommend a free program called JKDefrag which has recently been renamed and released under the name MyDefrag. Just Google it and you’ll find it. It works great and it’s what I use. Finally, many software programs install “stub” programs at Windows startup to make launching them “appear” faster. Selectively going through and disabling some of these will reduce the time it takes for Windows to become functional after it has loaded. One good program to use is called AutoRuns and it’s from Microsoft. You need to be careful and really should know what you are doing when using programs like these so you don’t prevent Windows from starting correctly, but if you are fairly tech-savvy and proceed with caution, you should be OK.